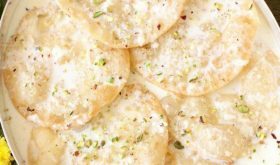 Mawa peda is a perfect choice for celebrations or your festive menu during holi, diwali or navratri. Mawa peda or khoya peda is calorie rich but hard to resist, indulgent Indian sweet. Full fat milk is cooked on low flame till it is reduced to one fourth of its original quantity. 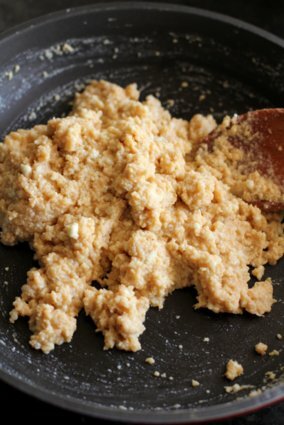 The resultant mixture is called mawa aka khoya. 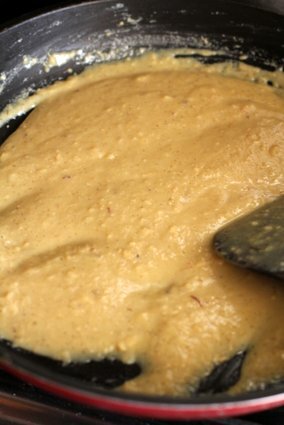 Sugar, saffron infused milk and cardamom are added to the mawa mixture which is simmered on low flame till it leaves the sides of the pan. Small balls are rolled out of the cooled mixture and garnished with nuts. If using store bought mawa, this festive sweet is a breeze to put together. 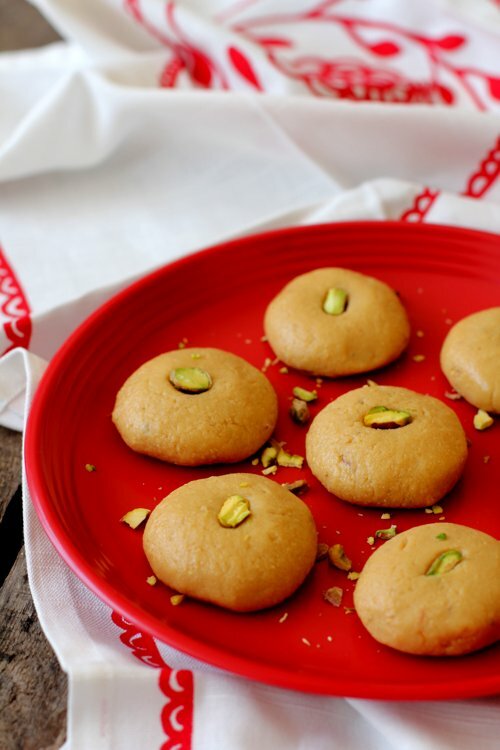 If made from scratch, khoya peda is a labour intensive process since preparing mawa at home does take a lot of time. 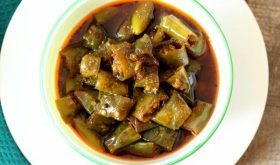 I have already posted khoya recipe (also called as mawa) earlier. 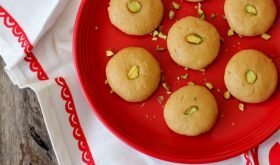 Prepare mawa and follow the instructions, step by step photos to learn how to make mawa peda at home. 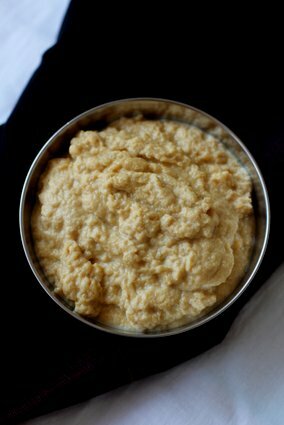 Prepare khoya by following khoya (mawa) recipe link provided above. Add saffron strands to the warm milk and set aside. 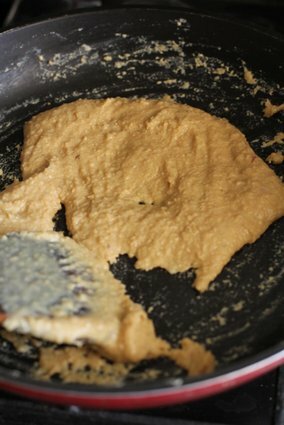 Heat ghee in a wide shallow non-stick pan. 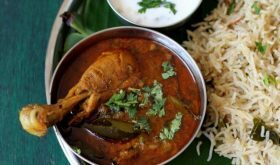 Once it turns hot, add the crumbled mawa and saute for 3 mts on low flame, stirring continuously . Add the milk and sugar and mix. It will get liquidy. Keep stirring on low flame. Add cardamom powder and mix. Soon the mawa will thicken and leave the sides of the pan and form a large lumpy mixture. Turn off flame and allow the mixture to come to room temperature or warm enough for you to handle. Grease your hands, make small balls and lightly flatten. Place a pistachio in the center and serve. If you do not have saffron on hand, you can omit it. 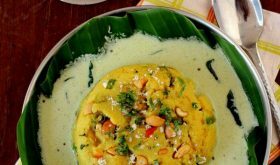 Use plain milk instead of saffron infused milk. 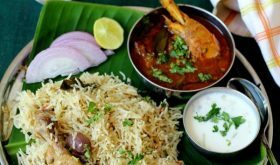 Almonds or cashew nuts can also be used. You can add 2 tbsps of milk powder at the time of adding sugar and milk. By Sailu Published: February 25, 2015 mawa peda is a rich indian sweet made for festivals like diwali, holi & navratri. 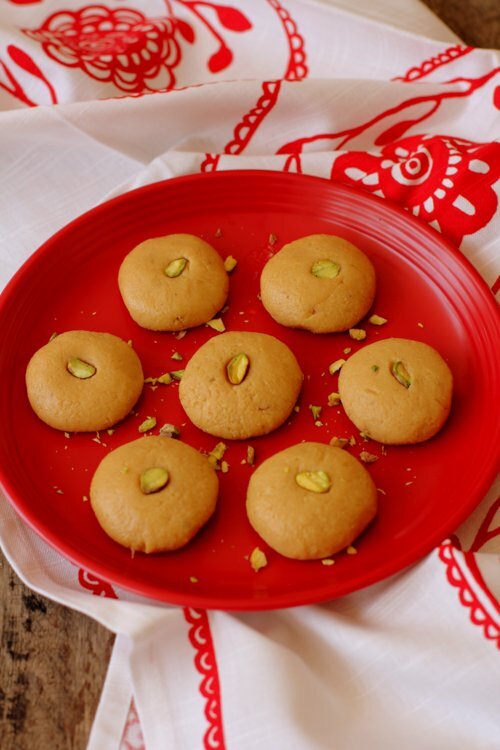 learn how to make mawa peda aka khoya peda recipe that's simple and easy.